The other day I was wondering what kind of food us ladies with PCOS crave, but don’t usually eat because of sugar or gluten. I decided to ask on my Facebook page what recipes you ladies most crave and the most common answer was sweets. 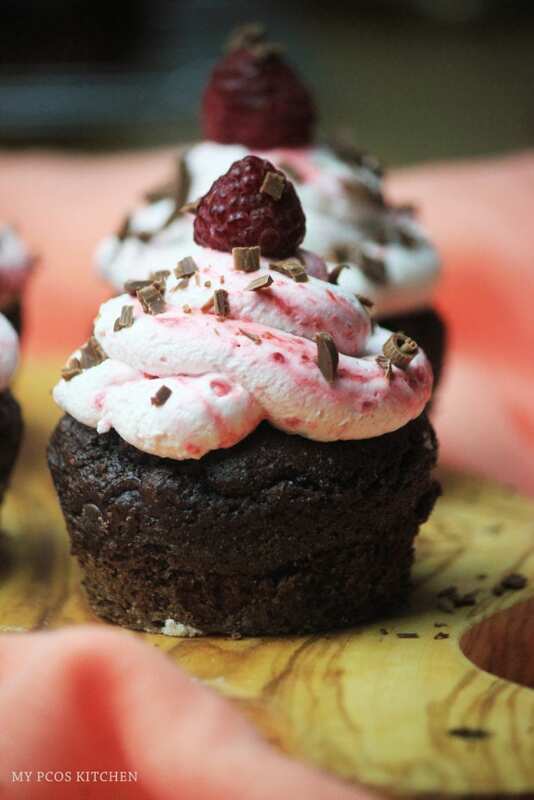 A couple of ladies mentioned cupcakes and cake in general, so I thought I’d make some chocolate cupcakes tonight to show you that you can indeed eat sweets using PCOS-friendly ingredients! I really enjoy baking so these cupcakes were really fun to create! The cupcakes themselves aren’t too too sweet; the frosting is flavoured with fresh raspberries so the sweetness of the frosting and the semi-sweet bitterness of the cupcakes go very well together! 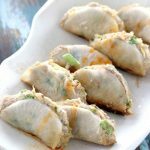 I didn’t add any refined sugar in these so that they would stay paleo friendly. They are sweetened with stevia powder and honey. For the cupcakes I chose to simply add unsweetened cacao powder, instead of adding chocolate chips, so that the carb count would stay low. I also used a mixture of almond meal and coconut flour for the batter base, instead of using a gluten-free flour blend. 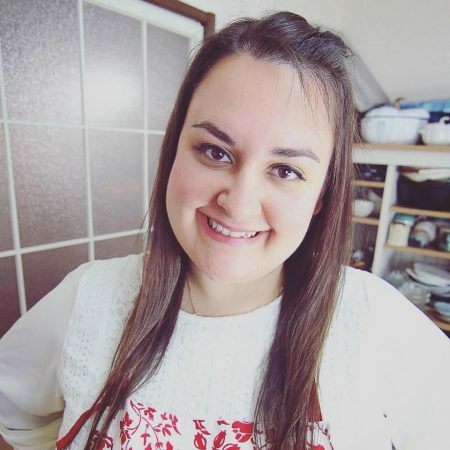 I usually add 1/4 to 1/2 cup of gluten-free flour to my batters when I bake because I find it makes the cake hold well together, but I found that it wasn’t needed for this recipe. For the frosting, I decided to use some jersey cow cream, but you could use coconut cream, or raw cow milk if paleo (not pcos). I blended the whipped cream with some crushed raspberries to give it a nice ripple effect. 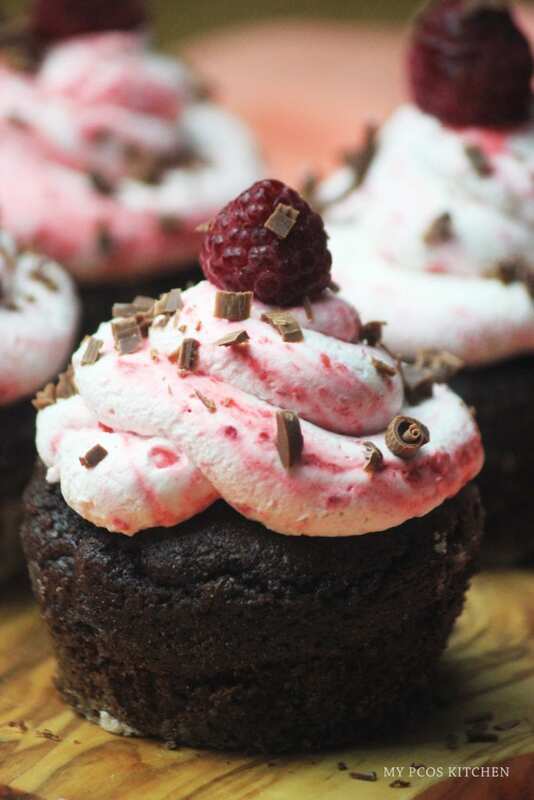 I topped it with some shredded dark chocolate and a fresh raspberry. All in all, I found that these cupcakes were really fluffy and moist! 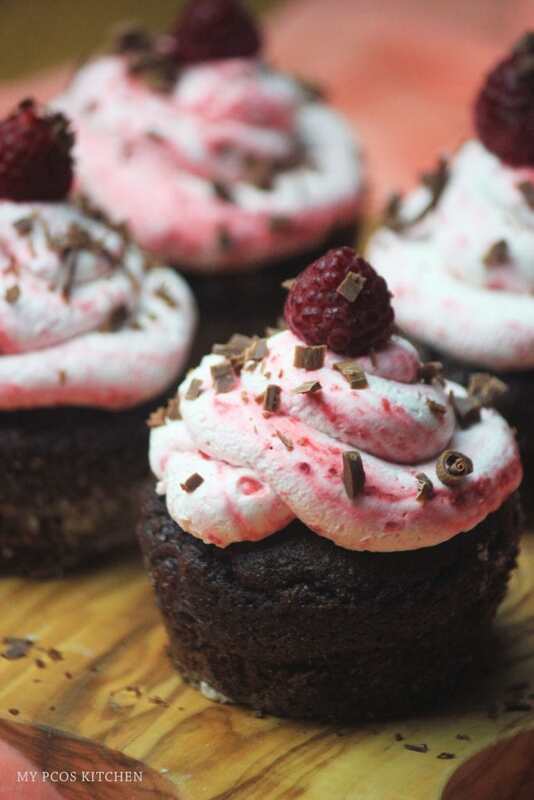 I’m really glad I had raspberries on hand because I’ve always loved to eat chocolate and raspberries together! I personally never use muffin liners when I make cupcakes or muffins because I don’t like it when the cake sticks to the paper. The Japanese liners here are horrible, half of your cake will stick to the paper and you’ll have to fight with the paper just to get your cake back. Instead, I like to oil/butter my muffin moulds and dust them with some flour (gf/coconut). To the PCOS ladies who asked for some sweet recipes, I hope you enjoy these delicious moist cupcakes! They’re the perfect treat for us perfect ladies. 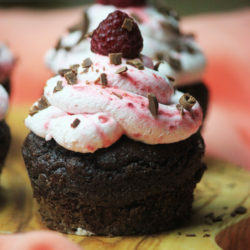 I made sure to make these with pcos-friendly ingredients and these ended up being only 250 calories and 9.29g net carbs per cupcake! 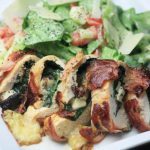 My low-carb tummy is definitely happy with these! Note that if you wish to add chocolate chips to the batter, make sure you use chips that are sugar-free. There are chocolate chips out there that are sweetened with stevia powder so that can always be a good option! You can add 1/2 cup of chocolate chips to the batter to make it more chocolaty. However, by doing so you’ll be adding about 39 calories and 4.29g net carbs per cupcake! 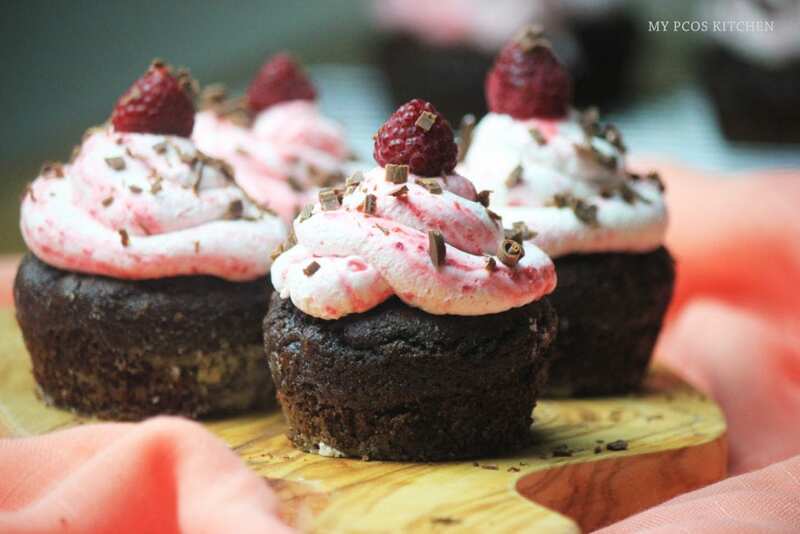 Succulent PCOS-friendly chocolate cupcakes that contain no gluten, refined-sugar, or grains! In a large bowl, mix the almond meal, coconut flour, cacao powder, baking soda, baking powder, salt and stevia powder together. In a separate bowl, mix together the eggs, almond milk, ghee, vanilla and honey until well incorporated. Add some muffin liners** to a muffin pan and pour 2 generous tbsp of batter into each mould. Bake in the oven for 16-20 minutes, or until a toothpick inserted in the middle comes out clean. Take out of the oven and completely cool for 30-40 minutes. When your cupcakes are cooled, make the frosting. Add the raspberries to a food processor and pulse until a puree forms, about 30 seconds. Using a hand mixer, whip the cream and stevia powder together until peaks form. 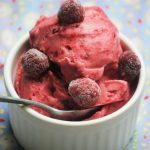 Fold in the raspberry puree and only mix 2-3 times. You want the raspberry puree to make a ripple effect in the cream. Add the whipping cream to a piping bag attached with a round nozzle, and pipe the cream over each cupcake. Add one raspberry over the cream. 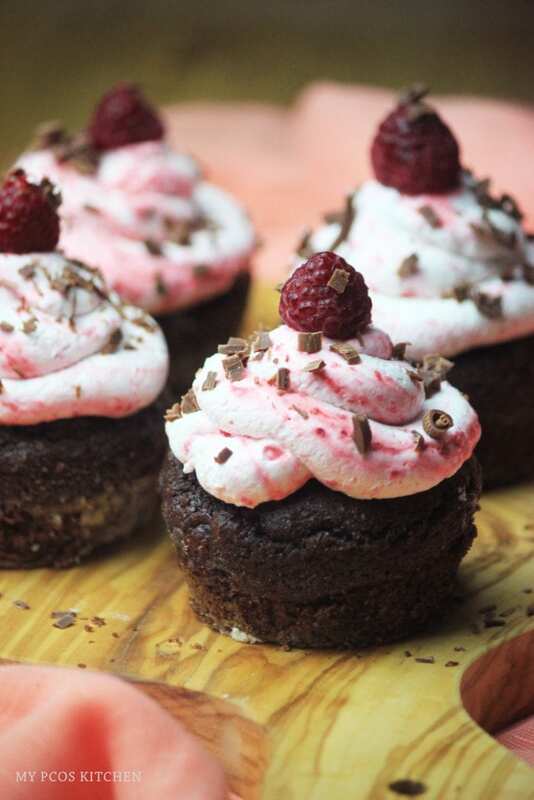 Using a peeler or cheese grater, grate the dark chocolate over each cupcake to complete the decoration. *If using coconut cream, make sure the can of coconut milk has been chilled overnight in the refrigerator or it will not whip. **If you don't want to use muffin liners, brush each muffin mould with some coconut oil and sprinkle some coconut/gf flour over. This will ensure that the cupcakes don't stick to the pan. ***You can add 1/2 cup of sugar-free chocolate chips to the batter, but this will add 39 calories and 4.29g net carbs to each cupcake.